The proposed LNG plants in Kitimat depend on supply from the planned Chevron Pacific Trails fracking gas pipeline. The Unis’tot’en clan of the Wet'suwet'en Nation have for over a year maintained a blockade of the planned Chevron Pacific Trails fracking gas pipeline as it passes through their territory. 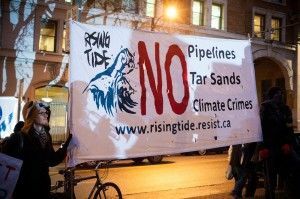 They are committed to blocking all the pipelines – whether for tar sands bitumen or fracked gas – from passing through their territory in order to protect not just their territory but also the global climate. Can you help them get to $12,000? Indyvan says "Plans to make the B.C. coast a global hub of LNG exports have not met the kind of opposition from environmental groups as seen by oil pipeline proposals such as Northern Gateway and Kinder Morgan’s TransMountain line." Actually the quote you are using is from The Canadian Press. Quite so. Should have been indyvan quotes CP.